If i can tolerate leaving the mucus in my throat, I leave it. I always clear my throat of as much mucus in the morning for a fresh start to the day. Even if I'm driving my car or at my desk at work, I'll bring a disposable cup or thick paper towel to spit into. Swallowing mucus seems to make matters worse. The more liquids you drink, the higher the chances the thick mucus is thinned out. After clearing your throat of mucus and spitting out the mucus, the throat is very often times dry. If you don't replenish the throat with liquid, you might beging to cough, which iritates the throat. If my sore throat is bad enough that I need to take a day off from work, I try to drink a gallon of liquids throughout the day. And I don't drink soda or other sugary drinks. I generally stick with honey mixed with orange juice, plain water (cold or warm), or fresh squeezed lemon in hot water with honey. When I have sore throat, I always carry around cough drops. Very often, I'll get a cough attack when in a quiet environment, such as a class or meeting. Then and only then do I pop a cough drop. Before calling it day, I try to gurgle a cup of warm salt water. I put as much salt in as I can easily handle. I find this doesn't greatly improved recovery time, but it does feel good and make it easier to sleep at night. 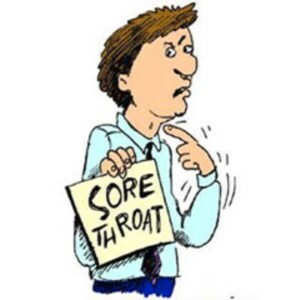 If I take care of my sore throat early enough in the process, I can often times avoid the week of coughing that sometimes follows a sore throat. I use the amount, thickness, and color of mucus in my throat as an indication of the healing process. Less mucus, thin mucus, and clear mucus are all signs of improvement.